Acute respiratory distress syndrome (ARDS) was first described by Ashbaugh and colleagues in 1967. The authors reported the condition as an acute onset of severe respiratory distress, cyanosis (hypoxemia) that is refractory to oxygen therapy, diffuse abnormalities on chest radiographs, and decreased lung compliance. 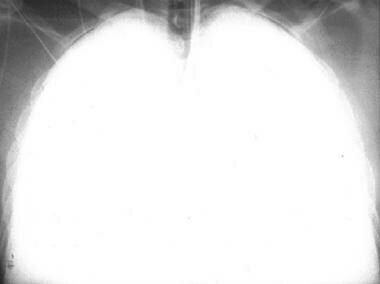 A chest radiograph depicting acute respiratory distress syndrome is provided below. Anteroposterior (AP) portable chest radiograph in a patient who had been in respiratory failure for 1 week with the diagnosis of acute respiratory distress syndrome. This image shows an endotracheal tube, a left subclavian central venous catheter in the superior vena cava, and bilateral patchy opacities in mostly the middle and lower lung zones. See Acute Respiratory Distress Syndrome: A Complex Clinical Condition, a Critical Images slideshow, for more information on this life-threatening condition characterized by acute respiratory failure, hypoxemia, and pulmonary edema. ARDS is a syndrome that commonly begins after exposure to a known risk factor. Why some people develop ARDS and others do not is still unknown. The risk factors for ARDS include primary pulmonary etiologies (eg, aspiration, pneumonia, toxic inhalation, pulmonary contusion) and extrapulmonary etiologies (eg, sepsis, pancreatitis, multiple blood transfusions, trauma, use of drugs such as heroin). Sometimes, ARDS is not only a reaction to another event but also the result of a known cause, such as an acute interstitial pneumonia (AIP) or a severe, extensive, infectious pneumonia. 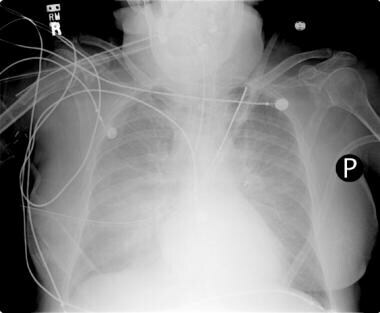 Portable chest radiograph in a patient with acute respiratory distress syndrome. The condition evolved over approximately 1 week. Portable chest radiograph. 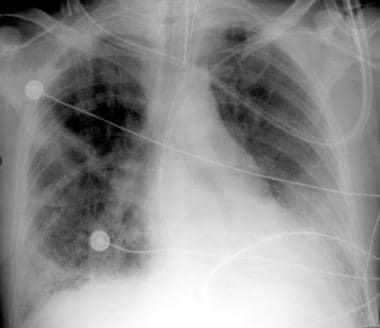 This image shows bilateral opacities that are suggestive of ARDS. Early findings on the chest radiograph include normal or diffuse alveolar opacities (consolidation), which are often bilateral and which obscure the pulmonary vascular markings. Later, these opacities progress to more extensive consolidation that is diffuse, and they are often asymmetrical. Again, effusions and septal lines are not usually seen on chest radiographs of patients affected by ARDS, although these findings are commonly seen in patients with congestive heart failure (CHF). Radiographic findings tend to stabilize (part of the clinical definition of ARDS); if further radiographic worsening occurs after 5-7 days, another disease process should be considered. In the fibrotic phase, chest radiographs may have an interstitial appearance, which is not necessarily due to fibrosis, because this finding may completely resolve in many patients who survive. Pathologic specimens have been analyzed, and the findings of severe lung fibrosis do not correlate with any specific portable chest radiograph findings, including reticular patterns. Computed tomography (CT) scans provide more detailed and more reliable information in areas of consolidation and fibrosis. If the patient survives, most radiographic abnormalities improve after 10-14 days. The speed and degree of this improvement vary widely from complete resolution before the patient's discharge from the intensive care unit (ICU) to gradual improvement over several months. Factors that affect the speed of recovery are not known, but they may be related to other medical factors (eg, patient's age, underlying disease states) that may have caused the onset of ARDS in the first place. Therapy for ARDS can affect the chest radiograph appearance. To improve oxygenation, the clinician may place the patient in the prone position. However, large clinical trials have failed to prove that there is any mortality benefit from prone positioning. 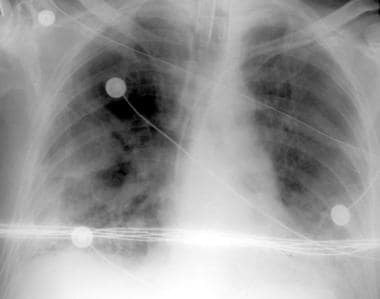 Chest radiograph in a patient with acute respiratory distress syndrome (ARDS). The patient was treated with perflubron, which is used for partial liquid ventilation. Mechanical ventilation with positive end-expiratory pressure (PEEP) is another common therapy in ARDS. Chest radiograph findings when PEEP is applied vary from no change to apparent hyperinflation. 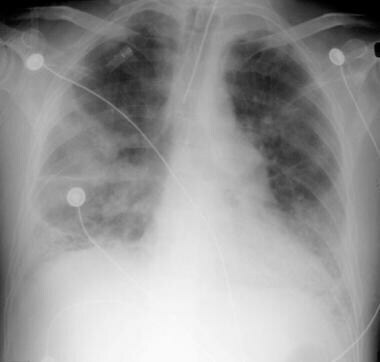 Higher levels of PEEP may result in barotraumatic changes, which include vesicular rarefactions, pulmonary interstitial emphysema (lucent streaks toward the hilus), radiolucent halos around vessels, pneumatocele formation, subpleural emphysema as manifested by blebs or lucent lines on the chest radiograph, pneumothorax, mediastinal emphysema, and extrathoracic gas collection. When PEEP is initially applied or increased, lung opacities may appear to improve; or if PEEP is reduced, the opacities may appear to worsen, despite the fact that the clinical signs are stable or contrary to improvement or worsening of these opacities on radiographs. The AECC definition of ARDS is usually used in investigations of the syndrome. Several entities can mimic ARDS, and attempts to exclude these diseases are important. Lung injury scores are sometimes used in clinical trials, and the chest radiograph interpretation can be weighted 50% or more in these scores. For this reason, some investigators have questioned the reproducibility of chest radiograph readings between clinicians. High interobserver variability in chest radiograph interpretations occurs, even between experts. On the other hand, the chest radiographs are very accurate in the diagnosis of ARDS, with rates as high as 84%. The accuracy of the chest radiograph reading is stage dependent, and observer disagreement is highest in the early disease phases. Accuracy of the clinical diagnosis is also dependent on the pathologic stage. Computed tomography scan in a patient with suspected acute respiratory distress syndrome (ARDS). This image was obtained at the cardiac level with mediastinal window settings and shows bilateral pleural effusions instead of diffuse bilateral lung consolidation. In addition, the presence of some compression atelectasis in the lower lobes is observed. 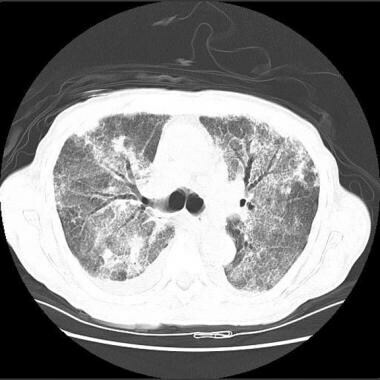 High-resolution computed tomography scan in a patient with acute respiratory distress syndrome. This image demonstrates a small right pleural effusion, consolidation with air-bronchograms, and some ground-glass-appearing opacities. The findings indicate an alveolar process, in this case, alveolar damage. On CT scans, ARDS that is due to pulmonary disease tends to be asymmetrical, with a mix of consolidation and ground-glass opacification, whereas ARDS that is due to extrapulmonary causes has predominantly symmetric ground-glass opacification. CT scans of ARDS patients with AIP tend to have more symmetric consolidations, more basilar distribution, and more honeycombing (26%) than those patients without AIP (8%). In patients with ARDS from either cause, pleural effusions and air bronchograms are common, and Kerley B lines and pneumatoceles are uncommon. If a patient is placed in the prone position, as they sometimes are in an attempt to improve oxygenation, the consolidations shift over time to the anterior portions of the lung parenchyma, which are now in the gravity-dependent portions of the lung. Because of a lack of positive outcome data, logistics, and possible complications of this procedure, it is not often used. In one study, CT scanning was performed on a cohort of patients about to be placed in the prone position. Although good evaluation of the patients' pathologic lung changes were seen, the authors were unable to select out any findings that would predict which patients eventually responded to prone-position ventilation. CT scanning can be used to detect the pathologic features and complications of ARDS that are occult on chest radiographs largely because the diffuse consolidations of ARDS obscure other findings, which include the following: pleural abnormalities (eg, pneumothorax), parenchymal disease (eg, nodules, focal opacities, interstitial emphysema), and mediastinal disease (eg, enlarged lymph nodes). In one study, pneumothorax was missed on supine chest radiographs and detected with CT scans in one third of the patients. Also, the position of a thoracostomy tube can be better delineated with CT scanning so that the need for repositioning can be determined. In the later stages of ARDS, CT scanning is more reliable than the chest radiograph in the detection of suspected fibrosis as the changes that accompany fibrosis become more apparent. Findings that are suggestive of fibrosis and better visualized on CT scans include traction bronchiectasis, lobular distortion, intralobular lines, and in advanced cases, cystic lung destruction (also called honeycombing). 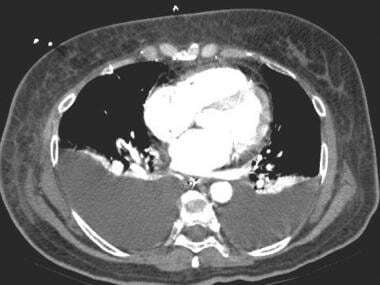 ARDS therapies can also alter the CT scan appearance. The use of perflubron in partial liquid ventilation causes a gravity-dependent patchy or homogeneously white appearance on CT scans. The movement of perflubron out of the lungs has been documented and may occur because of hematogenous spread. Extrapulmonary perflubron may also be present in the lymph nodes, pleural space, mediastinum, and retroperitoneum. CT scanning has also been used to evaluate patients who survive ARDS. In one study, 6-10 months after ARDS patients were discharged from the hospital, CT images of their chests revealed more ventral than dorsal pulmonary fibrosis in 87% patients. The extent of the fibrotic changes correlated with the severity of ARDS as well as the duration of mechanical ventilation during which high peak pressures (>30 mm Hg) or high oxygen levels (>70%) were used. Positron emission tomography (PET) scanning has been used in studies of extravascular lung density (EVD) and pulmonary vascular permeability with the pulmonary transcapillary escape rate (PTCER). [35, 36] In studies, patients with ARDS had a PTCER and EVD that were higher than those of healthy control subjects, and the findings were most dramatic in the early phase of ARDS. The PTCER remained elevated in patients with ARDS, even after the EVD had returned to normal levels. The PTCER can be used to estimate capillary permeability by watching for the accumulation of injected gallium-68 (68Ga) citrate, which is attached to native transferrin, in the lung parenchyma. ARDS is a noncardiogenic pulmonary edema condition; therefore, fluid and protein are translocated across the lung vascular endothelium into the interstitium. These measures are used only in experimental studies, not in routine clinical situations. Ashbaugh DG, Bigelow DB, Petty TL, Levine BE. Acute respiratory distress in adults. Lancet. 1967 Aug 12. 2(7511):319-23. [Medline]. Pesenti A, Musch G, Lichtenstein D, Mojoli F, Amato MB, Cinnella G, et al. Imaging in acute respiratory distress syndrome. Intensive Care Med. 2016 May. 42 (5):686-98. [Medline]. Zambon M, Vincent JL. Mortality rates for patients with acute lung injury/ARDS have decreased over time. Chest. 2008 May. 133 (5):1120-7. [Medline]. Pierrakos C, Karanikolas M, Scolletta S, Karamouzos V, Velissaris D. Acute respiratory distress syndrome: pathophysiology and therapeutic options. J Clin Med Res. 2012 Feb. 4 (1):7-16. [Medline]. Bernard GR, Artigas A, Brigham KL, et al. The American-European Consensus Conference on ARDS. Definitions, mechanisms, relevant outcomes, and clinical trial coordination. Am J Respir Crit Care Med. 1994 Mar. 149(3 pt 1):818-24. [Medline]. Kazerooni EA, Pranikoff T, Cascade PN, Hirschl RB. Partial liquid ventilation with perflubron during extracorporeal life support in adults: radiographic appearance. Radiology. 1996 Jan. 198(1):137-42. [Medline]. [Full Text]. Rotta AT, Gunnarsson B, Hernan LJ, Fuhrman BP, Steinhorn DM. Partial liquid ventilation with perflubron attenuates in vivo oxidative damage to proteins and lipids. Crit Care Med. 2000 Jan. 28(1):202-8. [Medline]. Toro-Figueroa LO, Meliones JN, Thompson AE. Perflubron partial liquid ventilation in children with ARDS: a safety and efficacy pilot study (abstract). Crit Care Med. 1996. 24:a150. Muellenbach RM, Kredel M, Wunder C, et al. Arteriovenous extracorporeal lung assist as integral part of a multimodal treatment concept: a retrospective analysis of 22 patients with ARDS refractory to standard care. Eur J Anaesthesiol. 2008 Nov. 25(11):897-904. [Medline]. Peter JV, John P, Graham PL, Moran JL, George IA, Bersten A. Corticosteroids in the prevention and treatment of acute respiratory distress syndrome (ARDS) in adults: meta-analysis. BMJ. 2008 May 3. 336(7651):1006-9. [Medline]. Ranieri VM, Rubenfeld GD, Thompson BT, et al. Acute respiratory distress syndrome: the Berlin Definition. JAMA. 2012 Jun 20. 307(23):2526-33. [Medline]. Martin D. The New Definition of ARDS. Medscape Medical News. October 26, 2012. [Full Text]. Ketai LH, Godwin JD. A new view of pulmonary edema and acute respiratory distress syndrome. J Thorac Imaging. 1998 Jul. 13(3):147-71. [Medline]. Maurer J, Kendzia A, Gerlach H, et al. Morphological changes in chest radiographs of patients with acute respiratory distress syndrome (ARDS). Intensive Care Med. 1998 Nov. 24(11):1152-6. [Medline]. Wheeler AP, Carroll FE, Bernard GR. Radiographic issues in adult respiratory distress syndrome. New Horiz. 1993 Nov. 1(4):471-7. [Medline]. Johnson TH, Tytle TL, Cooke RE. Adult respiratory distress syndrome: radiologic manifestations and course. South Med J. 1984 Sep. 77(9):1136-8. [Medline]. Wakabayashi T, Tamura M, Nakamura T. Partial liquid ventilation with low-dose perfluorochemical and high-frequency oscillation improves oxygenation and lung compliance in a rabbit model of surfactant depletion. Biol Neonate. 2006. 89(3):177-82. [Medline]. Ricard JD, Iserin F, Dreyfuss D, Saumon G. Perflubron dosing affects ventilator-induced lung injury in rats with previous lung injury. Crit Care Med. 2007 Feb. 35(2):561-7. [Medline]. Hirschl RB, Pranikoff T, Wise C, et al. Initial experience with partial liquid ventilation in adult patients with the acute respiratory distress syndrome. JAMA. 1996 Feb 7. 275(5):383-9. [Medline]. Leach CL, Greenspan JS, Rubenstein SD, et al. Partial liquid ventilation with perflubron in premature infants with severe respiratory distress syndrome. The LiquiVent Study Group. N Engl J Med. 1996 Sep 12. 335(11):761-7. [Medline]. McLoud TC, Barash PG, Ravin CE. PEEP: radiographic features and associated complications. AJR Am J Roentgenol. 1977 Aug. 129(2):209-13. [Medline]. [Full Text]. Johnson TH, Altman AR, McCaffree RD. Radiologic considerations in the adult respiratory distress syndrome treated with positive end expiratory pressure (PEEP). Clin Chest Med. 1982 Jan. 3(1):89-100. [Medline]. Tagliabue M, Casella TC, Zincone GE, Fumagalli R, Salvini E. CT and chest radiography in the evaluation of adult respiratory distress syndrome. Acta Radiol. 1994 May. 35(3):230-4. [Medline]. Caironi P, Carlesso E, Gattinoni L. Radiological imaging in acute lung injury and acute respiratory distress syndrome. Semin Respir Crit Care Med. 2006 Aug. 27(4):404-15. [Medline]. Easley RB, Fuld MK, Fernandez-Bustamante A, Hoffman EA, Simon BA. Mechanism of hypoxemia in acute lung injury evaluated by multidetector-row CT. Acad Radiol. 2006 Jul. 13(7):916-21. [Medline]. Ketai L, Paul NS, Wong KT. Radiology of severe acute respiratory syndrome (SARS): the emerging pathologic-radiologic correlates of an emerging disease. J Thorac Imaging. 2006 Nov. 21(4):276-83. [Medline]. Helm E, Talakoub O, Grasso F, et al. Use of dynamic CT in acute respiratory distress syndrome (ARDS) with comparison of positive and negative pressure ventilation. Eur Radiol. 2009 Jan. 19(1):50-7. [Medline]. Mrozek S, Jabaudon M, Jaber S, Paugam-Burtz C, Lefrant JY, Rouby JJ, et al. Elevated Plasma Levels of sRAGE are Associated with Non-Focal CT-Based Lung Imaging in ARDS patients. : A Prospective Multicenter Study. Chest. 2016 Mar 23. [Medline]. Tomiyama N, Muller NL, Johkoh T, et al. Acute respiratory distress syndrome and acute interstitial pneumonia: comparison of thin-section CT findings. J Comput Assist Tomogr. 2001 Jan-Feb. 25(1):28-33. [Medline]. van der Werf TS, Wolf RF, Tulleken JE, Ligtenberg JJ, Zijlstra JG. The vanishing heart--deterioration on chest radiography with clinical improvement during prone position ventilation. Br J Radiol. 1998 Apr. 71(844):447-9. [Medline]. [Full Text]. Papazian L, Paladini MH, Bregeon F, et al. Can the tomographic aspect characteristics of patients presenting with acute respiratory distress syndrome predict improvement in oxygenation-related response to the prone position?. Anesthesiology. 2002 Sep. 97(3):599-607. [Medline]. Simon M, Braune S, Laqmani A, Metschke M, Berliner C, Kalsow M, et al. Value of Computed Tomography of the Chest in Subjects With ARDS: A Retrospective Observational Study. Respir Care. 2016 Mar. 61 (3):316-23. [Medline]. Nobauer-Huhmann IM, Eibenberger K, Schaefer-Prokop C, et al. Changes in lung parenchyma after acute respiratory distress syndrome (ARDS): assessment with high-resolution computed tomography. Eur Radiol. 2001. 11(12):2436-43. [Medline]. Leblanc D, Bouvet C, Degiovanni F, et al. Early lung ultrasonography predicts the occurrence of acute respiratory distress syndrome in blunt trauma patients. Intensive Care Med. 2014 Oct. 40(10):1468-74. [Medline]. Musch G, Venegas JG. Positron emission tomography imaging of regional lung function. Minerva Anestesiol. 2006 Jun. 72(6):363-7. [Medline]. [Full Text]. Richard JC, Le Bars D, Costes N, et al. Alveolar recruitment assessed by positron emission tomography during experimental acute lung injury. Intensive Care Med. 2006 Nov. 32(11):1889-94. [Medline]. Photomicrograph from a patient with acute respiratory distress syndrome (ARDS). This image shows ARDS in the exudative stage. Note the hyaline membranes and loss of alveolar epithelium in this early stage of ARDS. Photomicrograph from a patient with acute respiratory distress syndrome (ARDS). This image shows ARDS in the early proliferative stage. Note the type 2 pneumocytic proliferation, with widening of the septa and interstitial fibroblast proliferation. Photomicrograph from a patient with acute respiratory distress syndrome (ARDS). This image shows ARDS in the late proliferative stage. Note the extensive fibroblast proliferation, with incorporation of the hyaline membranes. 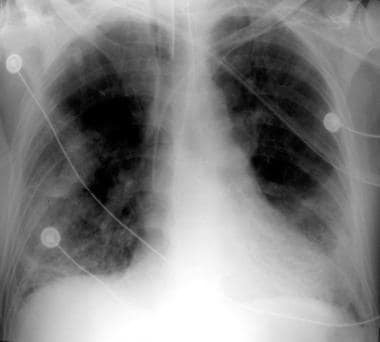 Fast Five Quiz: Are You Prepared to Confront Respiratory Failure? Fast Five Quiz: Are You Prepared to Confront Snakebites?